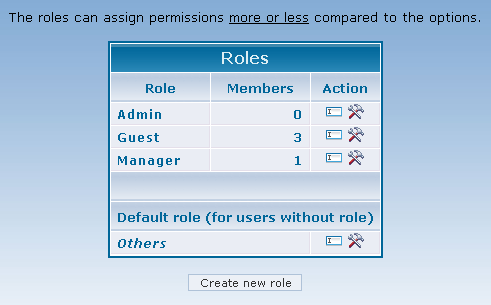 - Users roles management (server option : _ROLES_TO_OVERRIDE_PERMISSIONS). - Share bookmarks, server options: _BOOKMARKS - _BOOKMARKS_PUBLIC - _BOOKMARKS_VOTE - _BOOKMARKS_NEED_APPROVAL. - Server option (_LOCK_DURATION) account lockout duration (minutes) (on password errors). 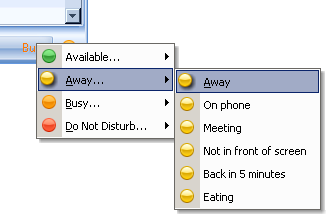 - Server options (_ONLINE_REASONS_LIST _BUSY_REASONS_LIST _DONOTDISTURB_REASONS_LIST) allow to add for each status (and not only for "away") a serial of reasons. - Server option (_TIME_ZONES) to disalow time zones. - Server option (_SHOUTBOX_PUBLIC) to public display ShoutBox. - Server option (_UNREAD_MESSAGE_VALIDITY) unread message validity (days). - Server option (_LOCK_USER_PROFILE) to lock profile access (for school). 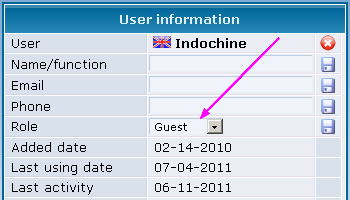 - Server option (_INVITE_FILL_PROFILE_ON_FIRST_LOGIN) invite to fill out profile information on first login. - Server option (_WAIT_STARTUP_IF_SERVER_UNAVAILABLE) if server unavailable on startup, client still wait (without warn). 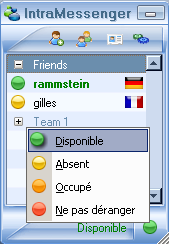 - Server option (_LOCK_AFTER_NO_ACTIVITY_DURATION) to lock ghost users: connected without any activity (send/get message, add contact...) after x days). - Button to restore previous configuration. - ShoutBox sticker on homepage (if public). - ShoutBox RSS Syndication (if public). - Can read all user's messages on ShoutBox (from user's profile). - Dashboard: username last registered user. .. Invision Power Board (version 3.1) - Open-Realty - Coppermine Photo Gallery (cpg) - Help Center Live - phpwcms - eTraxis - Friendika - Bonfire - PHProjekt (version 6) - FUDforum (version 3) - PHP-Fusion (version 7). - MySQL connection port number (write in file /common/config/mysql.config.inc.php). - Database engine (MyIsam or InnoDB) select on install. - Dynamic file im_setup.reg generation (if missing). - Server log: direct shoutbox display (if archiving enabled). - Archiving hack attempt (in server log). - Dutch (Netherlands) translation (thanks to Zippohontas). 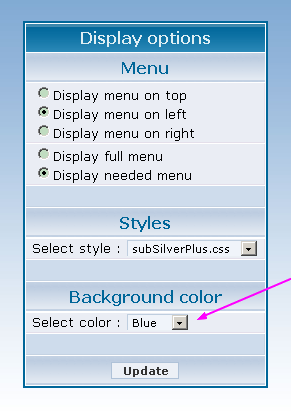 - Menu display select (top, left or right). - Select default language : spanish. - Options : the blue circles redirect to the new full options documentation. A default role to apply rights to users without role. Some permissions need to actives options. Example : active one of the ShoutBox permissions require to active the ShoutBox option . NEW : full options documentation integrated: /doc/en/options_list.html. 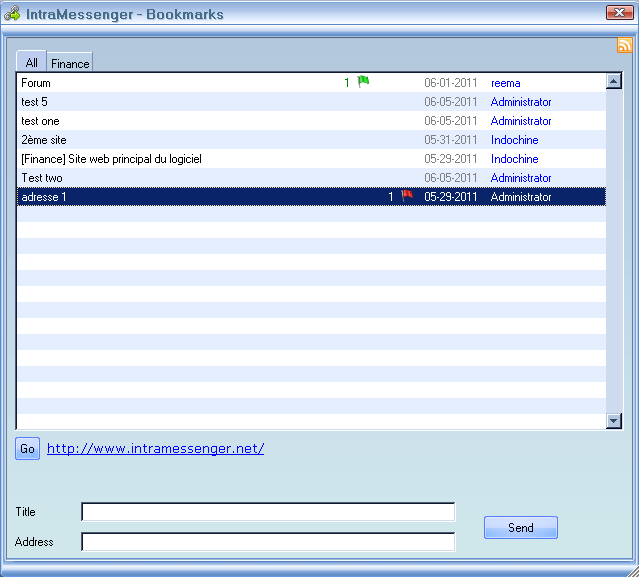 - register on internet IntraMessenger public servers directory.